No one expected Pakistan to chase 490, so when Pakistan ended day 4 with only 108 more to get with 2 wickets in hand, expectations changed. Hopes rose even further as the target got to less than 50 on the 5th day. But then, when another 40 odd runs were required, Pakistan lost Asad Shafiq, the man who had turned the first test between Pakistan and Australia on its head. It was a monumental effort by Asad Shafiq, which took Pakistan to 450 in the 4th innings. Easily their highest every 4th innings total, and the joint third highest 4th innings total ever. 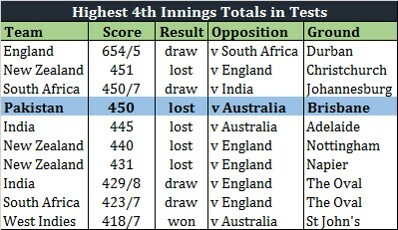 This Pakistan team has surprised us way too many times over the past 6 years, and especially in the 4th innings. The successful record making run chases in Sharjah and Palakelle, and now this epic effort at the Gabba. The man behind Pakistan achieving this record, created some records for himself too. Asad Shafiq has been a great addition to Pakistan's test line up and his performances at number 6 have played an instrumental role in the rise of Pakistan's test cricket over the past 6 years. He is undoubtedly the best number 6 that Pakistan have ever had, and now he is very close to being considered the best number 6 ever to play test cricket. His record shows you why. 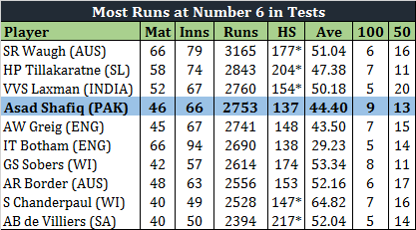 Steve Waugh is the ultimate number 6 and sits above all other batsmen in terms of number of runs scored in tests from this batting position. Asad is fast approaching Waugh and is now only 400 odd runs away from becoming the leading run scorer in tests from number 6. It will take a few innings before Asad Shafiq becomes the highest scoring number 6 in test cricket history, however he has already created a record for making the most centuries from that position breaking the record of 8, which was held by Sir Gary Sobers. As Asad brought up his first century in Australia in his first test downunder, Asad manage a unique feat that only Saeed Anwar had managed before him. 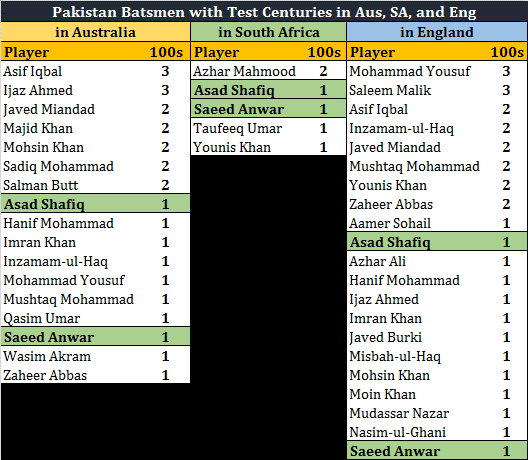 Asad is the only batsman from Pakistan, besides Saeed Anwar, who has scored a test century in Australia, South Africa, and England. None of the greats who have played tests in all these countries have managed that. Inzamam, Mohammad Yousuf, Younis Khan, none of them. That is surely a great achievement by Asad. Asad Shafiq is a HERO!